What made you want to build harps in carbon fiber? I realized in 2008 that as I got older, the harps seemed to get heavier. It also occurred to me that, if they’re getting heavier for me, they’re also getting heavier for the players as they haul their harps around for lessons, gigs, etc. 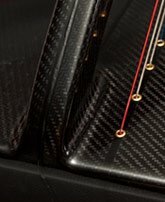 I knew that guitars and cellos had been made of carbon fiber for many years, with great success, so I decided to see how it would work for harps. 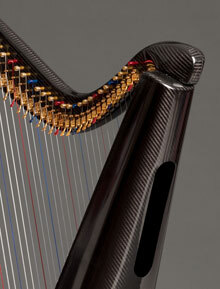 Carbon fiber had been used in harps before, but only for strengthening and reinforcing. This was the first time, to my knowledge, that anyone had tried to build an all-carbon fiber harp to make it as light as possible. What is carbon fiber, anyway? Thomas Edison was actually the first person to try using something like carbon fiber, in 1878. He burned a piece of bamboo in a nitrogen-filled tube, and ended up with about 40% carbon to use as a filament in his light bulb trials. It didn’t work. Carbon fiber was really developed in the late 1950’s, burning rayon in a nitrogen environment, and the development has continued since then. Now, a special chemical compound is burned (still in that original nitrogen environment) to yield tiny tubes of about 92% pure carbon – tiny as in about 5 microns thick (.000,005″). These tubes are then woven into carbon fiber threads, which are spun into c/f yarn and then into c/f cloth. It looks remarkably like black cloth when all is said and done. The carbon fiber cloth or material is available in various weaves, including tweed, herringbone, twill, etc., each weave having different strength characteristics. To make the harps, the carbon fiber cloth is impregnated with an epoxy resin compound and layers are carefully placed into custom-made molds and placed in an autoclave under high pressure and temperature for 24 hours to cure. Then we pin, string and lever the new harp just like a wood harp. How can Superlight Harps™ be so light? The real secret of the lightweight harps is the incredible strength of the carbon fiber, especially compared to wood. The average thickness of the walls of the Superlight Harps™ (yes, they’re all hollow, both the soundbox and the neck/pillar) is only .035″. That’s about as thick as 6 or 7 sheets of paper. So there’s just not much material in the harps to weigh them down. The other benefit of the thin walls is that they resonate incredibly well. To get technical for a second, a larger percentage of the energy you impart to the strings goes into sound production, producing a louder harp with less effort. This lightweight and high strength is why carbon fiber is now being used in modern aircraft, race cars, sports equipment, sailboats, etc. Are Superlight Harps™ really as indestructible as I’ve heard? Probably more so! In the real world, Superlight Harps™ have been knocked over, fallen out of carts, been clunked by doors, furniture or other harps, and generally taken all the knocks that all harps take over their lifetime. One was even left in the trunk of a black car in the middle of the summer for 4 days. The difference with the Superlight Harps™ is that they’re usually just fine after the incident. To demonstrate the toughness of these instruments, I’ve hit them with hammers, bashed them with tuning wrenches, poured water over them and even put one in a swimming pool and tried to play it underwater (that part didn’t work so well, because the harp wanted to float). None of this had any negative impact on the instruments. Some of the harp players watching were a little traumatized, though! Can an 8 to 11 pound harp sound as good as a comparable wood harp? The Superlight Harps™ can’t and don’t sound exactly like a comparable wood harp, but it can be hard to hear the difference. (You can make your own decision about the sound by taking the Superlight Harp™ sound test.) I’ve sold a number of Superlight Harps™ to players who just wanted one for that particular occasion, whether it’s to take it to lessons, or just play for outdoor weddings, or to take in the motor home and not have to worry about the heat. I can’t tell you how many times I’ve had these same players call me 3 to 6 months later and tell me that they haven’t played their wood harp since they got the Superlight Harp™, so could I help them sell the wood harp. I take this as a real endorsement of the sound quality and playability of these harps. Another endorsement of the sound qualities of these harps is that my wife, Pamela Bruner (I should mention that she has 19 CD’s out on the harp), sold her wood DragonHeart that I made her years ago. She now only plays a Delight, and loves both playing it and carrying it around. We look forward to discussing Superlight Harps™ with you!